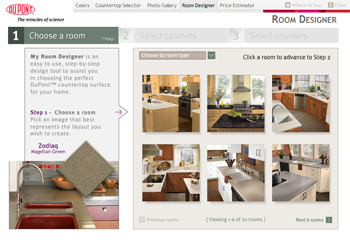 DuPont created the solid surface category more than 30 years ago. An advanced blend of natural materials and pure acrylic polymer, Corian® is a brand that has earned trust and respect as a proven material that brings design versatility, long-term performance and value to any environment. 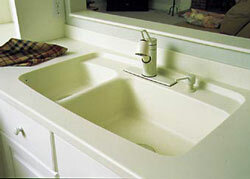 Corian® is manufactured by DuPont in the form of sheets and sinks. The sheets are precut into specific lengths at the factories and then shipped to a worldwide network of distributors. Authorized Distributors and Retailers of Corian® are trained professionals who help everyone who uses Corian® meet all specification, fabrication and installation requirements. Thanks to its unique balance of beauty and performance, Corian® lends itself to imaginative uses, innovative interpretations and enduring applications. If you can envision it, chances are you can create it with Corian®. The options are almost limitless. Do you need both design flexibility and elegance? A material that's great for work or play? A surface that can stand up to the challenges of time and punishing customers or substances? What about combining Corian® with tile, stainless steel, wood, granite or glass? It does play well with others. Are you looking for finishing touches like inlays and edge treatments? Or dramatic, thermoformed shapes that can engage, excite and express? Much more than a countertop, Corian® is just as appropriate for vertical applications as it is for horizontal surfaces. Or furniture. Or lighting. The list of possibilities continues to evolve and expand.